The Taiga Bean Goose breeds in Scandinavia and western Russia and winters mainly in southern Sweden, Denmark and, to a lesser extent, in northern Germany and Poland. Small numbers also winter in western Denmark, the Netherlands and Britain. In Britain, Taiga Bean Geese are concentrated predominately in two areas: the Slamannan Plateau, in Falkirk, Scotland, and the Yare Marshes in Norfolk, England. Taiga Bean Goose is a current conservation priority as the population has declined significantly in the past 10-20 years. An AEWA Species Action plan was drafted in 2015. † Bean Goose Anser fabalis is listed as ‘Least Concern’ by IUCN/BirdLife International. The Red List assessment of sub-species is not routinely undertaken. However, an assessment of Taiga Bean Goose Anser fabalis fabalis using IUCN criteria was undertaken as part of the UK’s Birds of Conservation Concern 3; the sub-species was evaluated as ‘Vulnerable’. Occur in too few numbers to calculate a meaningful trend. However, counts show numbers are decreasing at the Yare Valley, whilst at the Slamannan Plateau numbers have remained relatively stable in recent decades. The Taiga Bean Goose originates from the taiga zone of Scandinavia and western Russia, at least as far as the Ural Mountains. It winters predominantly in southern Sweden, Denmark and, to a lesser extent, in northern Germany and Poland. Some birds from more eastern breeding areas are thought to migrate through the Baltic States to reach Poland and Germany, instead of passing through the stop over sites in southern Sweden. Small numbers also visit western Denmark, the Netherlands and Britain. There are just two regularly used sites; the Yare Marshes, Norfolk (England) and the Slamannan Plateau, Falkirk District (Scotland). They are believed, however, to have been more numerous in historical times, particularly in Scotland, although some uncertainty exists over their former status because of possible confusion with Pink-footed Goose. Due to its importance for wintering Taiga Bean Geese, the Slamannan Plateau was designated as a Site of Special Scientific Interest (SSSI) and as a Special Protection Area (SPA) in 2008. The Yare Valley is also similarly protected. Outside Britain, uncontrolled hunting and habitat loss are the main concerns. The feeding ecology of Taiga Bean Geese has been studied principally in southern Sweden (e.g. Markgren 1963, Nilsson & Persson 1991). Stubbles are highly favoured during autumn, with cereals and grasses preferred later in winter. Waste crops, particularly sugar beet, are also used when available. Markgren, G. 1963. Migrating and wintering geese in southern Sweden: Ecology and behaviour studies. Acta Vertebratica 2: 297-418. Nilsson, L. & H. Persson. 1991. Selection and exploitation of feeding areas by staging and wintering geese in southernmost Sweden. Ornis Svecica 1: 81-92. Counts of Taiga Bean Geese in Britain are undertaken monthly during the autumn and winter at the Slamannan Plateau (Falkirk, Scotland), where they have been monitored since the mid 1980s. The surveys are carried out by the Bean Goose Action Group and Scottish Natural Heritage. Monthly counts are also made at the Yare Marshes (Norfolk, England) during the winter by the RSPB. Age assessments are also regularly undertaken at the Slamannan Plateau where counters record the number of first winter geese present as well as brood sizes (i.e. the size of family groups). The later arrival of Bean Geese at the Yare Valley, compared with Slamannan, makes it difficult for age assessments to be undertaken there because the young birds have typically completed their post-juvenile moult making it difficult to tell them apart from adults. 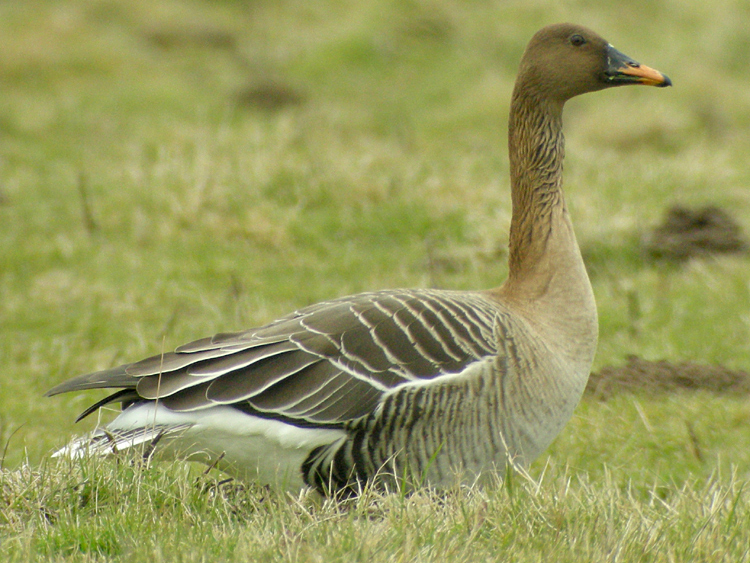 Monitoring of Taiga Bean Goose was undertaken at the Slamannan Plateau, Falkirk, by the Bean Goose Action Group and at the Yare Valley, Norfolk, by RSPB reserve wardens during winter 2017/18. A peak count of 206 birds was recorded at Slamannan, ten birds fewer than the previous year (216), lower than the previous ten-year mean (251 ± 7.7 SE) (Figure 1) and well below the peak there of 300 birds in winters 2005/06 and 2007/08. At the Yare Valley, where the number of wintering Bean Geese has been declining since 1993/94, the peak count of just 18 geese on 27 November was five birds fewer than that recorded during the previous winter (23) and the lowest since 1954/55. 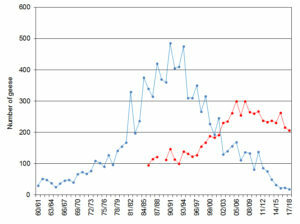 The slow decline of this important flock continues and the previous ten-year mean has declined to 78 birds (± 14.7 SE). The total count for the two sites in 2017/18 (224 birds) was the lowest since 1982/83 and continued the long and slow decline in numbers wintering in the UK which probably reflects the decline in the overall flyway population. The first 18 birds arrived at Slamannan on 25 September and this increased to 90 birds on 7 October. The highest winter count was of 206 birds on 20 December. Migration back to the spring stop over sites in Denmark again took place in mid-February 2018, with birds leaving between 16 and 20 February. At the Yare Valley, the geese again arrived slightly later than usual. No geese were recorded in October and the first birds (three individuals) were seen on 29 November increasing to 17 birds on 4 December. The highest winter count of 18 birds was recorded on 5 and 16 December. The last count was of 15 on 3 January 2018. The duration of stay of the Yare Valley flock appears to be getting shorter each year. No neck collared birds ringed in Sweden were recorded at the Yare Valley during winter 2017/18. Figure 1. Winter peak counts of Taiga Bean Geese at Slamannan Plateau, Falkirk (red squares) and at Yare Valley, Norfolk (blue circles) from 1960/61–2017/18. Age assessments at Slamannan indicated that 2017 was a reasonable breeding year for Taiga Bean Geese wintering in Scotland. Breeding success was estimated from a sample of 118 birds at Slamannan in early November of which 17 birds (14.4%) were aged as first winter, with a mean brood size of 2.13 young per successful pair. This is the best breeding success recorded in the flock after three years of very low productivity. Figure 2. The percentage of young (blue columns) and mean brood size (red line) of Taiga Bean Geese recorded at Slamannan Plateau, 2004–2017. Since the peak count of 300 Bean Geese in 2005/06 and 2007/08, numbers at Slamannan have declined, with the peak count in 2017/18 (206 birds) a decrease on recent years. With poor breeding success recorded at Slamannan between 2014/15 and 2016/17 (Figure 2), it is therefore perhaps unsurprising that the number of geese recorded there has decreased recently. However, breeding success in 2017, as recorded at Slamannan, was reasonable (14.4%), so it is perhaps surprising that the winter flock did not increase. Bean Geese are not legal quarry in Scotland (although one was shot illegally at Slamannan in winter 2017/18) and few are probably shot in Sweden, Norway or Denmark. There may be unknown sources of mortality affecting this small group, or there may be connectivity between the Scottish winter flock and those wintering on the continent. However, based on sightings of colour ringed birds, we know that only one of the 33 Bean Geese marked at Slamannan since 2011 has switched wintering area to the continent. The spring departure from Scotland was early and weather conditions in Denmark were harsh, with low temperatures and frozen waterbodies. The birds moved further north to southern Norway between 26–30 March and here they met deep snow. The poor weather conditions may impact on breeding in summer 2018. The migration story can be followed here https://sites.google.com/view/scotlands-bean-geese/migration. 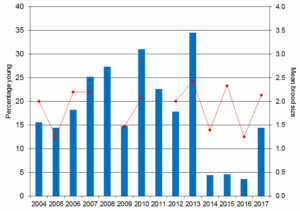 The decline at the Yare Valley has been remarkable, since over 400 birds were recorded there as recently as 1993/94. It is likely that rather than crossing the North Sea to winter in Norfolk, Bean Geese are ‘short-stopping’ and wintering in Denmark instead. This phenomenon might also help explain why the Slamannan flock is not increasing (but see above). Thanks are extended to Angus Maciver (Bean Goose Action Group) and Ben Lewis (RSPB) for providing additional information above. Colour-marking of Taiga Bean Geese began at the Slamannan Plateau, near Falkirk in 2001/02 by the Bean Goose Action Group, Scottish Natural Heritage and WWT. Since that winter, 39 birds have been caught and marked with neck collars. Nine birds have also been fitted with GPS-Global System for Mobile communications (GSM) transmitters attached to neck collars. The tagged geese have provided vital information on winter site use, the migratory routes taken and stopover sites used by these birds and where they breed (see here). In February, the geese leave the Slamannan Plateau and use stop over sites in northwest Denmark, and then in either south Sweden or southern Norway during March. By mid-April the geese move to west central Sweden, an area of mixed wetland/forest and seemingly ideal breeding habitat. These geese spend the entire summer there, including the moulting period in mid-summer when the birds are flightless. During August, the geese move south again using the same stopover sites in either south Norway or south Sweden before returning to Slamannan in late September or early October. Further details can be found on the project’s website, with updates in GooseNews 12 and here . Results from a recent GPS tracking project have also been published in Bird Study as Mitchell, C., L. Griffin, A . Maciver, B. Minshull & N. Makan. 2016. Use of GPS tags to describe the home ranges, migration routes, stop-over locations and breeding area of Taiga Bean Geese Anser fabalis fabalis wintering in central Scotland. Bird Study 63: 437-446.